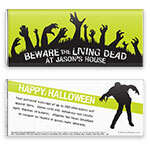 Crank up the creepiness factor at your Halloween party with this awesomely undead design. Design: Creepy zombie hands bursting from the ground. Personalization: Front personalization with back title and message.